Hansaduta Swami came with more mail during Srila Prabhupada's massage, and as His Divine Grace allowed me to squeeze, press, and rub his body, he heard the letters and gave his replies. Cittahari dasa, the president of our Auckland temple, wrote regarding Srila Prabhupada's suggestion, made in response to his previous inquiry last month that he deposit thirty thousand dollars he had received into the Mayapur-Vrindavana Trust account in Los Angeles. Cittahari expressed his reluctance to do this. "When I first came here as president three months ago there were debts of $45,000 owed by the Society brought about by mismanagement in both ISKCON and Spiritual Sky over the last three years. With the permission of Guru Kriipa Swami and Rsabdeva das in Los Angeles I have negotiated the sale of Spiritual Sky which was a financial liability and a drain on our preaching, temple, resources and men. "Due to this sale the financial situation has been eased a little but we are still in a position where our Temple is in danger of being sold to pay off the mortgage. Apart from this we have a large outstanding debt to your Bookfund. So I am begging your permission Srila Prabhupada to use the money in the service of Sri Sri Radha Giridhari here in Auckland and any excess I will send to Los Angeles as you have suggested." Prabhupada was sympathetic to both the situation and the fact that the money in question came from Cittahari's personal funds. He told him, "It is your money, so you can do with it whatever you like. If you feel the money is needed there, then use it accordingly. I have no objection." Kirtanananda Swami sent an inquiry about a new film the BBT is making, intended for training devotees in the art of book distribution. According to Kirtanananda the film shows a questionable method of collecting money, which may in fact be illegal. He feels that the film will be a danger to ISKCON and might be used as incriminating evidence if ever a court case is brought against us. Noting that his zone is probably number one in terms of books distributed per devotee, he said, "I simply want to know what You want and then I will be satisfied no matter the result. I might add that this technique is never used in this zone nor is the other technique of using lies, i.e. feeding starving children, collecting for VFW, etc., and we maintain a high standard. Why should we jeopardize the future of this movement on some questionable means that is not necessary? We say, 'Purity is the force,' then why is tricking necessary? This matter was supposedly resolved at Mayapura a year ago, but it seems that only a clear and unequivocal statement from Yourself can ease everyone's mind. Please forgive me for bringing this matter before You." Kirtanananda Maharaja also enclosed a check, in the hope that it would "ease Your headache," and added that the Palace they are building is attracting many visitors and should be ready for Srila Prabhupada by next spring. Prabhupada agreed with his concern over the film. "A film showing illegal techniques of distributing my books (Money shuffle) was never authorised by me. If it is actually a fact what you say, then stop it immediately. In all our dealings we should be above suspicion. They say first impressions are lasting. If someone feels cheated by our men because they are using dubious methods of distribution and collecting money, our purity may be doubted and reputation spoiled. So please do not allow such film showing to take place until I have seen the film personally." There was a letter from Mrs. Tania Perera of Melbourne. She had given a gold chain to Srila Prabhupada when he visited there in April. She wrote expressing her desire to become a devotee and her difficulty in doing so, due to the adverse reaction of her husband. He is very inimical to her involvement with Krishna consciousness, and she felt that it was becoming impossible to maintain both situations. She was now in desperation and was asking Srila Prabhupada what to do. Srila Prabhupada remembered her and was sympathetic. He offered her shelter. "Regarding your situation, the only alternative is to move into the temple and take complete shelter of the devotees and Krishna. Prahlad Maharaj was only 5 years old and because of his becoming a devotee of the Lord his father tried to kill him in so many ways. So that your husband is against Krishna is nothing astonishing, it is quite normal. So if you like you can leave him, and move into the temple of your choice." Radhaballabha prabhu sent a couple of questions relating to the book production in Los Angeles. "In the beginning of each book we list all the other books you have written. Would it be alright to list Gitar Gan? If so, how should it be spelled?" He asked if a composed manuscript entitled Sri Caitanya Mahaprabhu: His Life and Precepts should be put into print, and he had a question about a reprinting of the Adi-lila of the Caitanya-caritamrita. "Due to Pradyumna's previous difficulties we were forced to produce the second and third volumes one year before we received all the manuscripts for the first volume. Consequently, the volume turned out to be extremely large and the distributors find it extremely difficult to distribute. Would it be approved by you to re-divide the Adi-lila into four parts before the next printing?" News has also gotten back to him about Prabhupada's comment in Delhi last month that he may skip the Tenth Canto of Srimad-Bhagavatam and go straight to the eleventh and twelfth. He asked if this was true. Finally, Radhaballabha offered an apology for disturbing Srila Prabhupada with his questions. "I only hope you will continue to allow me to serve you despite my abominable character." Prabhupada approved the inclusion of his Bengali book in the list of books and gave the spelling. "Geetar gan [Bengali] may be added in the front piece as you have suggested, spelling as above with Bengali in brackets." As for the manuscript on the life of Lord Caitanya, he said that there was no need to print it, since the material was already included in other books. And he approved the reprinting of the Adi-lila in four volumes. As far as his current work goes, he still has not made up his mind. "Let me finish 9th canto; then I shall decide, most probably I shall start 11th canto, but as yet I have not decided." One of our older devotees, Sacimata dasi, wrote from Germany, where she has recently settled. She expressed her happiness in having obtained, without any of her own endeavor, Deities of Sri Sri Gaura-Nitai. 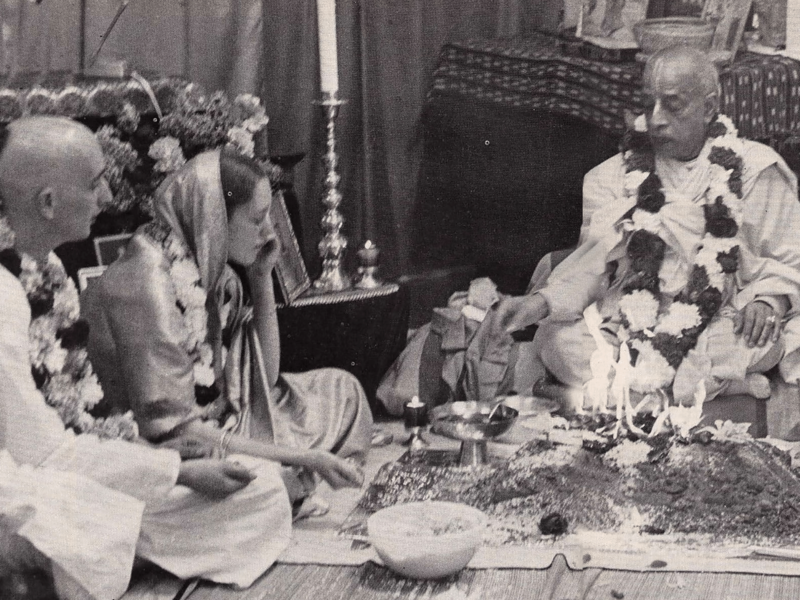 She felt that the unusual circumstances by which she got Them was quite mystical and asked Prabhupada's permission to worship Them in her home. She also requested guidance on whether she should come to India to serve. Srila Prabhupada wrote back encouraging her to start the worship of Their Lordships, although he did not encourage her to think of Their appearance as anything other than the natural result of her performance of bhakti-yoga. "There is nothing mystical about getting Gour Nitai deities for worshiping. The Lord is all powerful and omnipresent, he knows the heart of the devotee and reciprocates with the devotee accordingly. So now the Lord has come to your home and agreed to be worshiped by you, therefore everything should be clean and neat. Nice prasadam should be offered regularly and distributed to guests. Kirtan may be performed morning and evening and some discussion from Bhagavad-gita as it is, or other books from our publications." He suggested that she remain in Germany and preach to her own circle of friends. He felt that since she was older she might find India too difficult and so she should simply take whatever opportunity was available for service. "Chant Hare Krishna and help spread this movement in the best way open to you."